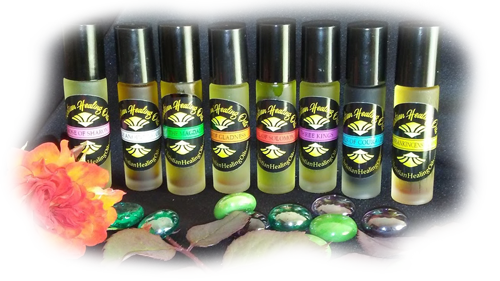 All Christian Healing Oils™ are 10ml bottles with deluxe roller heads for easy application. They are lightly aromatic from natural, organic ingredients, and are specially formulated using biblical references. 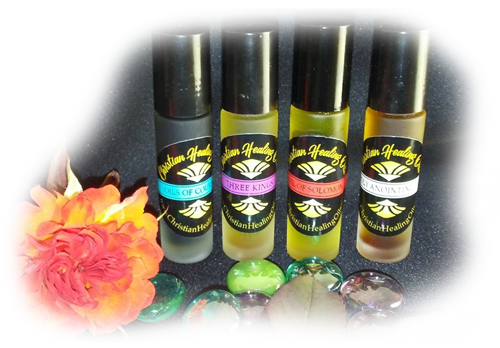 Enjoy all 8 healing oils and “The Yeshua Prescription” at a 25% discount! Enjoy 4 Oils and “The Yeshua Prescription” Healing Manual at a 20% Discount! HOLY ANOINTING OIL of Moses Exodus 30:23-24. God gives Moses and all generations to follow a recipe for anointing oil. It includes: Myrrh, Cassia, Cinnamon, Calamus and First Olive Oil. This is the oil given to Aaron and his caste of apothecaries to purify the Temple and the congregation. Jesus sent this oil with his disciples to heal the sick. Good for all situations and for bringing awareness on all levels. GOLD FRANKINCENSE & MYRRH were the gifts (frequencies) of the Magi given to Jesus for his initiation into mastery. Gold brings wealth, happiness and comfort. Frankincense & Myrrh were used for purification and healing. They were more expensive than gold. Good for initiations, purification, blessings and abundance. Also good for emotional trauma. OIL OF THE MAGDALENE blends Spikenard, Myrrh, and organic almond oil. This is the blend used by Mary Magdalene on the feet of Jesus before the crucifixion. It alleviates pain, fear, and anxiety. It can be used for deep meditation. OIL OF SOLOMON Exodus 3:30-34 Frankincense, Myrrh, Galbanum, Cistus and Damascus Rose with Almond Oil imparts wisdom and leadership to the wearer. Solomon used it to connect to the spirit world. It connects the root and crown chakras (central nervous system) to clear and align all energy centers and assists the rise of Ascension energy (kundalini). THREE KINGS has the essences of Sandalwood, Myrrh, Juniper, Frankincense, and Spruce with Almond Oil. This blend opens the subconscious mind through pineal stimulation. It releases deep seated trauma. It is grounding and spiritually uplifting at the same time. Brings inner peace and tranquility; it is a vehicle for increased psychic awareness and spiritual enlightenment. ROSE OF SHARON Song of Solomon 2:1 This is Cistus the Desert Rock Rose. It heals the wounded heart and opens one up to new emotional experiences. It was used by the ancients to heal wounds, regenerate cells and boost the immune system. OILS OF COURAGE contains the essences of Rosewood, Blue Tansy, Frankincense and Almond Oil. This blend was used by Roman soldiers before battle. It has the emotional impact of stimulating courage. It actually lengthens the spine, adds confidence, purpose, serenity, communication and self-awareness. OILS OF GLADNESS Hebrew 1:9 This blend contains Frankincense, Myrrh, Clary Sage, Ylang Ylang, Litsea with Almond Oil. These essences impact the emotional centers of the brain and affect a positive and uplifting feeling. Increases psychic ability and the capacity for inspiration, learning skills and discipline. Brings joy to your life!